A third shaft is visible on the north side of the beck, its surrounded my a fence again, but all thats visible are the top two rows of bricks and a lot of rubbish. 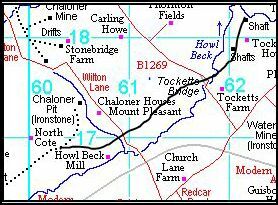 There is a rough track from Tocketts Mill to here. Two mine shafts are easily visible from the footpath though the woods. The first is a pumping shaft surrounded by a fence, it is 70ft deep and full of water and debris, a bricked up passage can be seen which was presumably to let water flow out into the beck after pumping. The second is an air shaft with a large chimney, to aid the airflow in the sheltered valley. Upleatham Church (almost) the smallest in Britain. There is evidence that the mill existed in 1649 and it was used for milling until the 1920s. The site contined as a farm but was eventually demolished in 1971. There are a number of remains in the area, as well as the obvious buildings, theres a dam upstream from which a mill race can be traced to the mill. An archaeological dig was performed by Stephen Sherlock in the last 80s, the report from this can be found in Redcar Library.